Bonus match (to add a second week of TV.) Apache threw a drink in Venum's face to set up Super Fly's German suplex. Taurus beat Aerostar with a Michinoku Driver. Scoria beat Murder with a top rope legdrop. The rudos team name is Los Xinetez (altered spelled of Jinetes). The show started out with Pentagon leading a moment of remembrance for Hayabusa. Pentagon then declared he would win the Rey de Reyes, but was interrupted by the kanji signal for Dragon on the video board. Pentagon was confused. The symbol was revealed to be for the debuting Octagon Jr., acknowledged as ex-Fireball/Flamita. 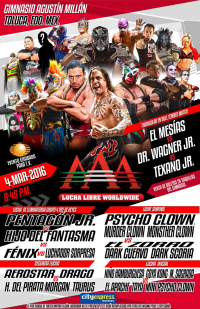 In the match, Fantasma beat Fenix, Octagon Jr. beat Fantasma, and Pentagon beat Octagon with Copetes maybe helping. 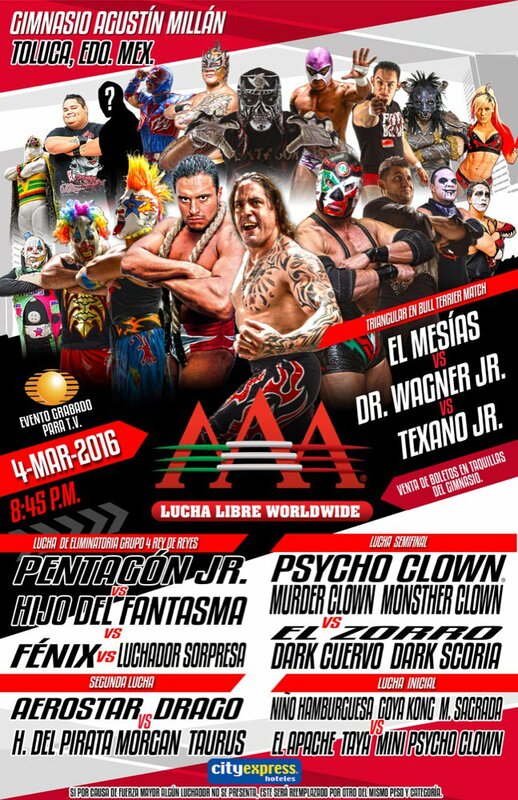 Mesias won after Psycho Clown got involved. The opponents in the singles matches on Rey de Reyes (Texano/Mesias and Wagner/Psycho) brawled post match. Los Perros del Mal destroyed both teams after the match. Said to be a dark match. Hamburguesa splash for the win. Faby asked Taya for a title match. Taya said no since Faby had not beat her directly. Octagon Jr. was announced as the surprise luchador a few days prior and got a better reaction on this show. Fenix beat Marvin with a huracanrana. Ricky Marvin told the press this was the start of a new chapter in his career. Los Perros del Mal interrupted post match (and may have distracted earlier) to tell Averno & Chessman that Lider & Daga were winning the tag titles at Rey de Reyes. Garza beat Taurus. (Said to be Taurus' first defeat, but he lost in Rey de Reyes as well.) 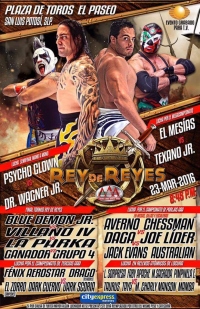 Pentagon said he'd beat Demon, Parka and Villano at Rey de Reyes, then go after Jack Evans next. Mesias and Texano didn't get along but it didn't cost the match. Wagner beat Psycho Clown with a Michinoku Driver, then challenged Psycho Clown for a title match and a mask match. Psycho tried to respond but Wagner took his mask. Mini Psycho Clown replaced Mini Charly Manson. Octagon Jr. was the surprise luchador and pinned Mamba with a 450 splash. first defense. Zorro beat Fenix with a Canadian Destroyer. Zorro beat up Fenix after the match. first defense. 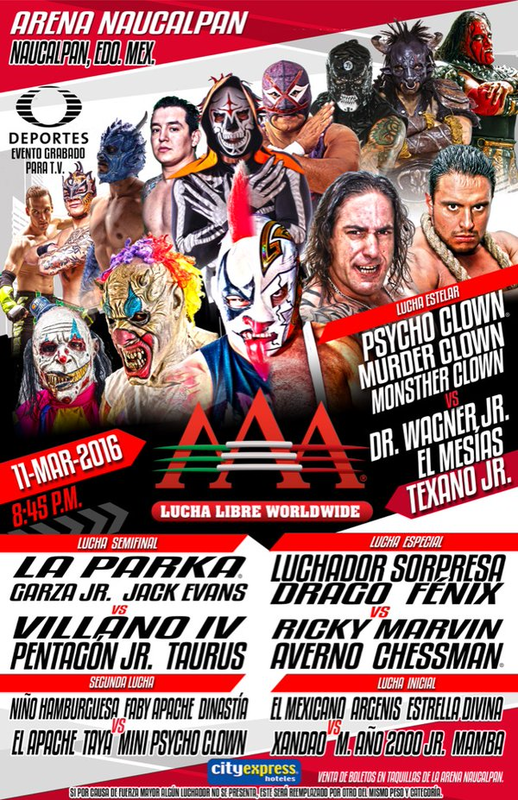 Argenis replaced Jack Evans (illness). Chessman won after Averno was stretchered out. Blue Demon advanced to final but did not show. Parka beat Villano and Pentagon beat Parka. The Perros del Mal celebrated, but were attacked by Pagano, Halloween, Damian and Nicho who claimed they were the real Perros del Mal. Brawl with blood. Seconds were Mascarita Sagrada and Villano IV, who got involved. Wagner used a foul to win. Wagner demanded a title shot against Psycho Clown. Texano won with a powerbomb to take the vacant championship. He's the 13th champion, this is his second reign.